Flavors, colors, and bark made only by a REAL WOOD FIRE. REAL WOOD FIRE made easy, with automatic temperature and combustion controls. Add a log twice per hour, and your KBQ will consistently produce pitmaster-grade barbecue. Unbeatable flavor, color, and bark. Moisture from desiccation AND combustion. Used by every great barbecue joint in America. Inverted Flame™ intrinsically produces thin blue smoke. Smoke Selector™ tailors flavor and color. AutoDraft™ regulates temperature. In a decade of R&D, we made all the mistakes for you. Leverage our commitment to get the results you want. In hours, not years. Man has been cooking meat above a fire for about a million years. KBQ turns this arrangement on its head. 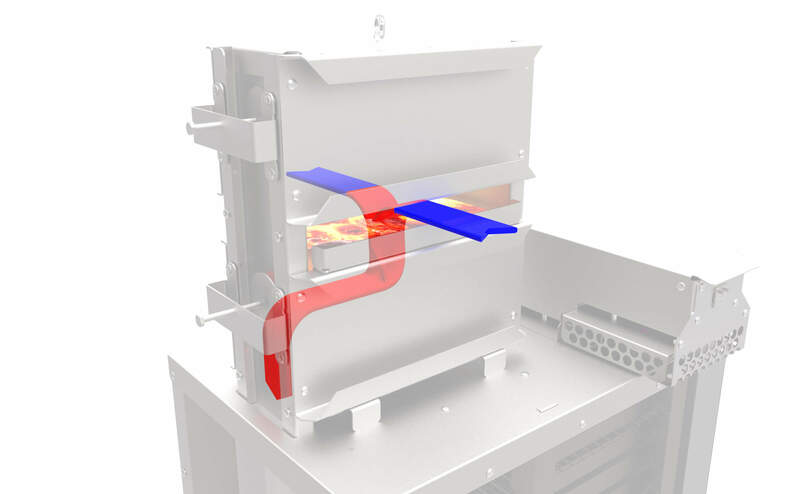 When a KBQ Firebox operates in Inverted Flame™ mode, smoke is drawn from below, pulling it through the hot bed of coals that is flooded with oxygen via adjacent air vents. This action completes the fire triangle, creating an Inverted Flame™ and the thin blue smoke that great pit bosses make after years of experience managing real wood fires. Two Firebox outlets select the type of smoke drawn into the Cookbox. The lower outlet inverts the flame to produce thin blue smoke, lighter and sweeter flavors, and burgundy to mahogany bark ‒ ideal for longer cooks like briskets and pork butts. The upper outlet bypasses the coalbed to produce visible smoke, heavier and smokier flavors, and darker bark ‒ great for shorter cooks like sausage and chicken. Opening both outlets moderates flavors and colors and is perfect for ribs. Some folks can make a clean-burning wood fire; others can tend one to keep a steady 250F. Few can do both at the same time. Since a KBQ Firebox intrinsically controls smoke quality at any draft rate, temperature control becomes simple ‒ AutoDraft™ replaces the smokestack with a thermostatically-controlled fan. 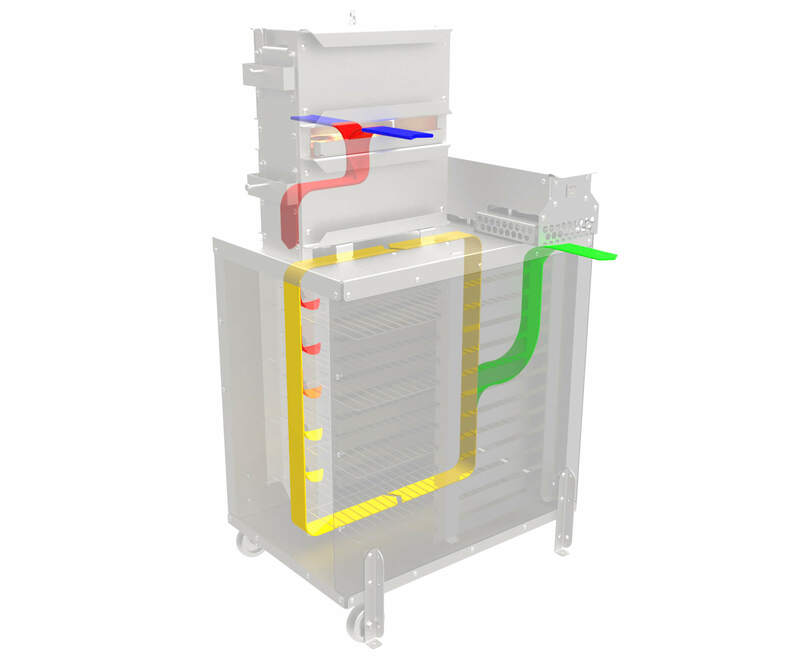 With the Draft Fan ON, vacuum in the Cookbox draws hot smoke from the Firebox, tempering it with convection flow to improve temperature uniformity. With the Draft Fan OFF, convection continues but no heat enters the Cookbox ‒ all components are arranged to preclude a natural draft. "The Karubecue C-60 Pit is a very innovative, wood burning smoker designed to help the greenest novice smoke meats like a wizened Texas pit boss. The smoke quality from this machine is astonishing ... The entire system has a simplicity which belies years of relentless research and development." "I was very impressed by this amazing technology - it has great possibilities. The design is straightforward, and it uses real logs like a stickburner. But proof is in the pudding, and the product was awesome." "KBQ has devised a clever, and patented, approach that overcomes the limitation of pellet smokers. KBQ uses a thermostatically-controlled fan to draw high-quality smoke from an external firebox. The smoke is sucked from the bottom of a fire built from chunks of burning wood. This turns conventional barbecue on its head." NATHAN MYHRVOLD, CHRIS YOUNG, ET AL. "I've used it for several projects: large hams, small hams, bacons of every kind, pig heads, boneless beef chuck ribs, mutton ribs, pork ribs, and more. It's beautifully designed and built. The control of smoke smoke source — under or over — is a fantastic feature. I don't think I could ask for much more in a smoker." "I am in love with your smoker. I am toying with just keeping it on the line and smoking things as they are ordered. It’s unreal. My whole staff wants to use it every day. Great balance of smoke and flavor. As long as you make them I will never buy another smoker and only recommend the KBQ." "Don't know what to say that's not already been said. It basically makes offset smoker quality food, without the 500+ pounds of metal, learning curve, testing, head scratching, tuning plates, cold spots and creosote." "I owned and used a vertical stainless steel charcoal smoker, a vertical gas smoker, a pellet smoker and a Klose horizontal offset wood burner. In over thirty years of smoking meats, the KBQ makes the best Q with the fewest brain cells involved. 'Pitmaster for dummies' indeed!" "I am in the metal fab business and we engineer and produce parts and assemblies out of steel, stainless, and aluminium. With that said I was very, very impressed with the build quality of this machine. It is built like a tank." "Neighbors who might otherwise shun me and kick my dog now offer to mow the lawn when the aromatic bouquet of protein-infused KBQ smoke wafts their way." "Wow! If you are a tech head, a meat head, or both, this unit will not disappoint. Just yesterday I took it out of the box and was immediately impressed by the quality packaging. Assembly was a piece of cake and the fit and finish were great. The results were simply stunning ... and I have never used a smoker in my life prior to this." "I spent a lot of time reading about this smoker online before purchasing it, and I had very high expectations. In no way was I disappointed. I have several other smokers including a stick burner, an ugly drum smoker, an insulated box smoker (charcoal), and a Kamado. This leaves all the others in the dust." "I tried [my C-60/SS] out today on a pork shoulder. It works extremely well! I like that it reduces the number of variables a novice like me has to deal with." "Assembled the pit yesterday. Results were great. Thank you for making such a durable product! Packaging was immaculate, too. I wish more people put this kind of care and attention to detail into their products – the world would be a better place." "As I pulled each piece of the C60/SS out of the box for assembly, I was amazed at how each component was so well engineered. Tight tolerances, efficient use of space, easy assembly, and a very solid complete product. This is the type of American manufacturing that was bragged about in our nation’s past. I am so happy to see it back and better than ever. Thank you for the fast delivery, great customer service, and most of all an OUTSTANDING product." "Thank you for designing and building an outstanding pit. Since purchasing my pit a month ago, I’ve decided to dive into the world of competition BBQ armed with my KBQ and a team of championship winners. My chicken, ribs, pork shoulder and brisket are all coming out amazing. I’m happy with my purchase and hoping you’ll be making a bigger pit in the future as my team grows." "You have the best setup of all! Thanks for devoting your time to it! I have done perfect briskets, pork loins, salmon and these beef ribs are great! I may wear this out, so please keep on making them!" "Just wanted to let you know I’ve had about 3 smoking sessions since my Karubecue came in. Very easy to use, VERY easy to clean after cooking: it’s about time to start experimenting with the upper draw for overfire smoke. Thanks again for a wonderful product." "I did my first cooking this evening. Two racks of pork ribs using a mix of pecan and cherry wood. They turned out to be the best ribs I’ve ever done. Thanks again for the great product." "Finally had time to fire up the smoker. Cooked a brisket for 10 hrs. It was probably the best thing I have ever cooked. Can’t wait to try some baby back ribs." "After leading tours of over 230 commercial barbecue establishments across the country, I can say that the Karubecue: 1) Meets our rigorous standard of a traditional, wood-fired barbecue pit; and 2) Eliminates the barriers to making consistently great finished product. From our standpoint, that’s a WIN-WIN situation." "The KBQ is the BBQ of choice in my household. I do ribs once a month for my 4 kids and they know it’s rib day when it gets fired up. We live in Washington state so the fuel of choice is applewood; the clean creosote-free taste of KBQ’d pork ribs is truly to die for." "We often smoke for guests, and my friends all think I am a culinary genius. I have very little cooking talent, but the KBQ makes it easy. Thanks for making the smoker that makes me look like I know what I’m doing!"